NeverSeconds: I know a song about Peanut Butter and Jelly sandwiches! I'm Katy's mom. I've been reading this blog almost since the beginning. I noticed in all the meals from the US there wasn't a single peanut butter and jelly sandwich. Since that's a traditional lunch I thought it should be represented and Katy eats a lot of them. Our first day of school was on Monday and this was her lunch. Today she is buying a school lunch but she's taking peanut butter and crackers for her morning snack. About 10% of the American population is allergic to peanuts with reactions ranging from mild itching to shock and death in a small number of people. Because of this many schools have banned peanut products entirely. Katy's school goes on a classroom by classroom basis and it has worked well. Katy has never been in a class with a peanut ban. I found out on the last day of school last year that a boy in her class was allergic to peanuts but since he had to actually eat them to have a reaction his mother didn't request the class be nut free. The 1,500 number comes from a story in Reader's Digest. I got the 1,850 number for Katy for figuring 5 pb&js a week for ages 3, 5, 6, 7, 8, 9 and 10. When she was four she was in pre-kindergarten and was required to eat school lunch and the class was in a nut-free daycare center. A couple of times she cried an said "I just want a peanut butter and jelly sandwich". She ate them on weekends, though. Oh, the article also mentioned that the first pb&j recipe was published in 1901. Prior to that people at peanut butter and pimiento cheese. Yuck! Your school peanut policy seems so reasonable--as does the mother of the boy in Katy's class! Our school has a cafeteria where everyone eats together, so we have a school-wide peanut ban. I was surprised to see the PB&J sandwich, until you explained the policy. We've found another product, called Brown Pea Butter, that is very similar to peanut butter but non-allergenic. Sun Butter (made from sunflower seeds) is supposed to be really good but man is it expensive! And there's soy butter, too. The kids do eat lunch in the cafeteria but they wipe the tables down afterward and they eat with their class (no free-seating). The policy must work or they'd have gone to a school-wide ban by now. I have a neighbor who has four kids in grades 8, 5, 4, and 1. She thought there was a school-wide ban on peanut butter because when the oldest was there she was in a peanut-free class at least the first year and maybe every year. But when she was little they were told "no peanuts" so her mom thought that was the school rule and was surprised when I mentioned Katy taking peanut butter. They are pretty careful about food. Every year I have to sign a permission slip for Katy to eat any food used in a lesson. You check off if your child can eat something or if you want to send in a replacement food for the activity or just have your child not participate. And they don't do birthday cupcakes and the teacher and room mom get together about food for the two parties they have. looks yummy! what's ranch dressing? Mince the garlic with a knife and then sprinkle about an 1/8 to ¼ teaspoons of salt on it and mash it into a paste with a fork. Chop the parsley and chives very finely and add to the garlic. In a bowl combine all ingredients, tasting frequently and adjusting seasonings as needed. Chill for a couple of hours before serving, thin with milk or buttermilk if desired. It really needs the buttermilk, it is called the buttermilk dressing. I would leave off the sour cream and just use the mayo and buttermilk. That is the original recipe for the dressing. It's a creamy salad dressing. It helps the carrots go down a little easier. Been following VEG for quite some time. I'm very proud of her and find her mission and attitude inspiring. As a fellow Georgia girl, I'm glad to see my home state represented so well. Thanks, Katy and Katy's Mom! 9/10 health rating? Weeeeell.. nah, don't think so ^^ Way too much sugar..
Apart from the jelly in the sandwich, which is not a massive amount from what I can see, what's the problem? Fruit sugar is perfectly reasonable in any diet, it's dried fruit you have to watch out for, people are becoming way too obsessive about that particular issue. High sugar in the jelly and the peanut butter, too.. I guess, it would be very interesting to see how many calories this meal has. One problem I have with it, that all it's ingrediensts do taste (!)sweet. By eating meals like this often, a kid will kinda be trained into thinking "sweet food is good" and, in a result, will want to have and prefer sweet tasting food later in life too. These sweet ingredients might not be a problem right now, for a kid that uses large amounts of energy for playing, running etc. - but when it's trained to prefer sweet food and later, as a grown up, has a job where it doesn't need such large amounts of energy anymore, it might get a bit complicated. A child who is highly allergic can just be in the room with the peanuts or be around a child who has just eaten them. Strange as it sounds, that is the literal truth. It will send them into andphylactic, how ever it's spelled, shock and will kill them if they aren't carried to a hospital soon enough. They always have an epipen or two somewhere on there person to be injected with immediately, but the hospital an ambulance and hospital follows. Severe peanut allergy is a serous thing. It depends on the severity of the allergy. Most aren't that severe but when they are it's scary. Yeah, her lunch has some unnecessary sugar in it but it has protein, healthy fat, fiber, whole grains, fruit and vegetables. It would be better with some milk for calcium but she just won't drink it. And her appetite isn't big enough to add cheese or yogurt. I would have given it an eight. It certainly beats chicken nuggets, corn and chocolate milk from the cafeteria, though. Kind of wondering where the "whole grains" are. I know the sandwich was on "whole wheat" bread, but most "whole wheat" is not made from whole grain. I think there's gotta be a little dairy in the ranch, right? I love using choosemyplate.gov's SuperTracker (https://www.choosemyplate.gov/SuperTracker/default.aspx) to see the nutrition in my meals, and I'm pretty sure it would count the ranch (if ever so slightly)! I meant to type whole wheat. The main thing is it's not white bread that just sends you crashing after a little while. Some little friend of Katy's had chocolate-covered raisins in her lunch so now Katy wants some. She doesn't even like raisins! I did giver her two Girl Scout cookies for dessert today though. I checked the ranch bottle and it doesn't have any milk or calcium. Homemade stuff would have buttermilk but I'm not making homemade salad dressing! I live in Australia and when I was a kid I always though PB&J sandwiches sounded horrible because Jelly here is what you'd call Jell-O (I think - the wobbly dessert stuff). I wondered why you'd put that on a sandwich ! We call it jam here. Your lunch looks great. Peanut butter and jelly sounds such a odd combination to us British - I must try it sometime. What type of jelly do you use? Or, as we would call it, Jam. (Jelly in Britain is what you call Jello - it's strange how the language has changed). Your peanut rules seem very sensible - almost every school in Britain just has a complete ban on all nuts. Yes, Jelly in America is like Jam. I tried a long time ago PB & J Sandwiches and did not like at first, but later working too much with American Kids I learn how to eat and taste very good. specially Strawberry or Grape Jelly. In the US, we call it a peanut butter and jelly sandwich but depending on where you live, a lot of us call Jelly, "Jam" too. For a PBJ, typical favorites are strawberry or grape jam. I've used other berry jams but they aren't the same to me. As for my daughters school in South Carolina, just peanuts are banned so we have started using sunflower or almond butter. I find the rise in peanut and nut allergies interesting. I couldn't live without PBJ sandwiches!!!! google gave exactly 0 (zero) results when I looked for the number of german schoolkids dying at school because of an anaphylactic shock due a (pea)nut allergy. And, as far as I know, there isn't a schoolwide ban of peanuts an/or pruducts containing peanuts anywhere in Germany. So, how comes, that there aren't any terrible anaphylactic reactions at german schools every day? Ok, the number of people who are allergic to (pea)nuts is lower in Germany, than it is in Britain or especially in the USA - but there are still quite a lot kids who are allergic to (pea)nuts here, too. So.. have there been so many dangerous situations for kids at US or British schools that this (pea)nut ban really was needed? Or is it just people going nuts about (pea)nuts? In the states we have jelly, jam and preserves. Jelly is made just from the juice, jam (which is what Katy had in her sandwich) has more of the fruit pulp and preserves is pretty much all whole fruit. We usually get jam. For one thing, it's easier to spread than jelly. OH, I like grape, my husband likes strawberry, too. She'll also eat apple or blackberry, she isn't too picky. But strawberry is her favorite. I like the fruit butter, apple butter, pear butter, etc. Peanut butter nor Jelly/Jam (I'm pressuming its not sugar free jam, which might have been a better idea) are particulally healthy and neither is the ranch dressing to be honest but who cares, its not massivly unhealthy either. She could be clogging up her arterys by eating high fat burger and greasy chips/fries every day rather than her albeit quite sugery, and calorific (no idea if that's a word but I like how it sounds), yet balanced lunch! The ranch isn't too bad. Two tablespoons has 70 calories, 4.5 grams of fat and 1 gram of sugar. I gave her about two tablespoons and she ate about half of it. And she ate a whole lot of carrots along with it. It's not like when people take a healthy salad and then drown it in dressing pretty much defeating he purpose of the having the salad. For an AMERICAN school lunch this one looks great. Far better then the majority of public school lunches offered in the cafeteria, and MUCH better then a lot of packed lunches I have seen floating around in the cafeterias. For those who want to nitpick whether the lunch has enough grain, too much sugar etc, you need to realize that in children daily nutritional need to be scored across food consumption over the day/week and not over 1 meal. If the parent is willing to prepare and photo a meal to post it here.. I have a great feeling that this child gets a well balanced diet across the board. Starting next week I go back to packing 3 lunches per day= 15 per week. I allow my kids to purchase up to 4 school lunches a month. Those days give me a slight break.. if I am lucky they all choose the same days! Some days they have wonderfully balanced lunches.. other days I dump a lot of random items in there and clean out my fridge/pantry before I hit the grocery store. I know they get lots of healthier items at home in the mornings,evenings and weekends.. so I am not feeling pressured to send in lunch items that * fulfill a daily health value*.. I look for convenience, ease of packing/handling at lunch and speed at which the item can be consumed. I remember as a kid making myself a peanut butter and jelly sandwich. Of course in Australia "jelly" is the gelatinous wobbly dessert. Not realising that what Americans called jelly is the same as jam here I fixed myself a peanut butter and lime jelly sandwich. Awesome. This comment is awesome. 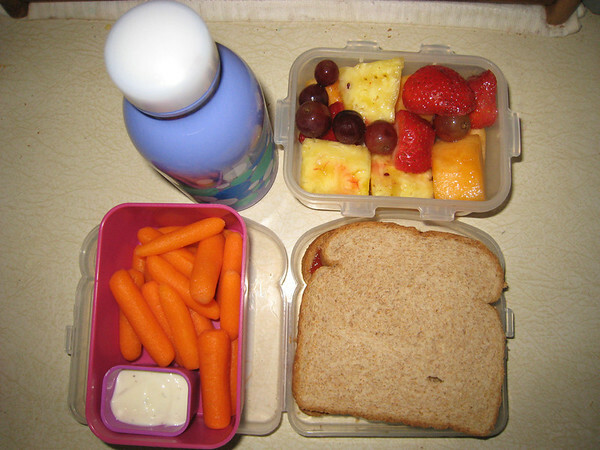 The school lunches in America differ greatly depending on where the child goes to school. My sons attend a private school in Pittsburgh, Pennsylvania and the food service offers an entirely organic menu, with several variations available at each meal (breakfast and lunch are offered, but my children do not eat breakfast at school). The school year has not started yet, but there is typically an entree, a side of grain, and a side of vegetable or fruit. They also provide a sandwich option, made to order from fresh deli selections, and a soup and salad bar. There is usually a dessert option, which I have been working with the school to reduce or eliminate. Dessert is not necessary for lunch unless it's fruit or a special occasion. We pay for their lunches separate from their tuition, so the cost is flexible. I'm proud of the choices my sons have for their school lunches.